Florida homeowners spend six months of the year in Hurricane Season. But what about the rest of the year? There’s never been a better time to protect your home with WinGuard Aluminum Windows and Doors. Impact protection and so much more! PGT WinGuard aluminum impact resistant windows and doors provide effortless protection from UV rays, noise and even intruders every day of the year. 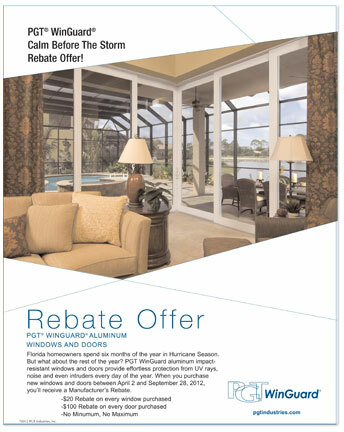 When you purchase new windows and doors between April 2 and September 28, 2012, you’ll receive a Manufacturer’s Rebate.